Digi-Schlock: PERFUME OF THE LADY IN BLACK (RaroVideo U.S. DVD) – Schlockmania! Over the years, the Italian DVD label Raro has endeared itself to multi-region capable cult DVD fans on this side of the Atlantic with a string of excellent releases of Italian horror and crime titles. The company has recently opened up an American arm of their operation to expand their reach. 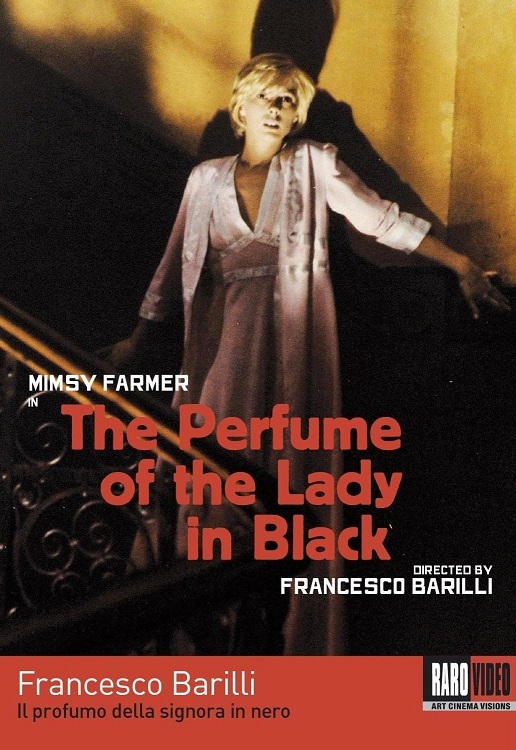 One of their early releases is Perfume Of The Lady In Black, a reissue of one of their European discs for a film that has never been available on DVD in the U.S. The results suggest Raro’s new branch is going to do well. This disc offers a strong transfer that does justice to this title’s dark, rich cinematography. The anamorphic image is clean and has depth to both its clarity and its somber color scheme. Both English and Italian soundtracks are provided, the latter including a set of easy-to-read English subtitles. They’re both original mono mixes and each sounds nice and crisp, with a smooth blend of sounds and no noticeable distortion. The major extra on this disc is an interview with director Francesco Barilli entitled “Portrait In Black.” It’s done in a standard, talking-head style but that’s not a problem because Barilli is a fascinating interview subject. He discusses the odd genesis of the project, his disagreements with Mimsy Farmer over the finished film and how a negative response from Italian critics actually enhanced the film’s box office earnings. His recollections are informed with a sly, cynical sense of humor that makes this an eye-opening and consistently interesting interview. All in all, RaroVideo U.S.’s disc of Perfume Of The Lady In Black is a winner for the domestic Euro-Cult fanbase. If you haven’t seen this longtime rarity yet, this disc offers a great way to get acquainted with it.